Simplicity and delicacy meet in this lighthearted addition to any room, perhaps a bedroom nightstand or favorite sunlit reading corner. 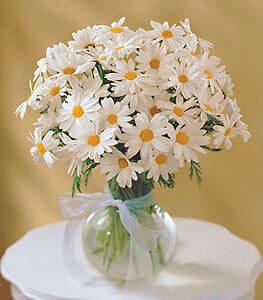 These cheery white daisies are a welcome greeting to someone special. Arranged in a glass vase, this sweet bouquet is great to send for any occasion - or just because.